The Challenger Plus outdoor bike racks are similar to the Heavy Duty Challenger bike racks, but these bike racks have a wider area between loops which makes it easier to park bikes. Constructed from 2-3/8" O.D. 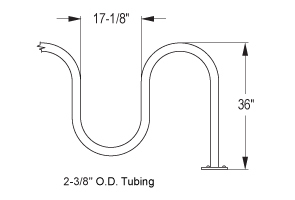 tubing the Challenger Plus is offered in various lengths up to 13-bike capacity to maximize bike storage capabilities. The sturdy frame allows the use of high security U-locks to secure the bike to the wave bike rack. The Challenger Plus outdoor bike racks are available in galvanized, powder-coated, and stainless steel finishes. Drop In Anchors available for concrete installation.